There's some interesting news about the great Permian extinction event of 250 million years ago. It was probably the largest mass extinction in the planet's history, wiping out 70 percent of land species and 95 percent of species in the oceans. The causes of the Permian extinction are still a little unclear -- there was massive volcanic activity going on (the Siberian Traps), there may have been an impact with a Giant Rock From Space, there may even have been an ice age going on. But that's all old news. The cool new stuff about the Permian Event is that it appears to have permanently changed the structure of ocean ecosystems. Before the Permian extinction, ocean ecosystems were apparently quite simple, based mostly on stationary filter-feeder organisms. Afterwards, they shifted to complex systems of mobile food-gatherers, a pattern which has continue to the present (despite a couple more mass extinctions along the way). The harsh conditions of the Permian extinction apparently gave creatures which could move around to gather food an advantage over stationary organisms. (Obviously there are still plenty of stationary organisms in the ocean, but now there are also lots of mobile ones.) And, of course, we are descended from those complex mobile organisms. Without the Permian Event, we wouldn't be here. This may have some relevance to the Fermi Paradox: perhaps planets which don't have periodic mass extinctions never develop complicated life forms capable of evolving intelligence. Another happy birthday today: the Royal Society turns 346, and I think most of us agree it doesn't look a day over 211. Happy Birthday R.S.! Happy Birthday to Bill Nye, who's been making science cool since 1992! His show Bill Nye the Science Guy may well be the best children's science program ever -- it didn't talk down to viewers, it didn't try to oversimplify complex issues, and it was highly non-lame. Here's wishing Mr. Nye many happy returns of the day. 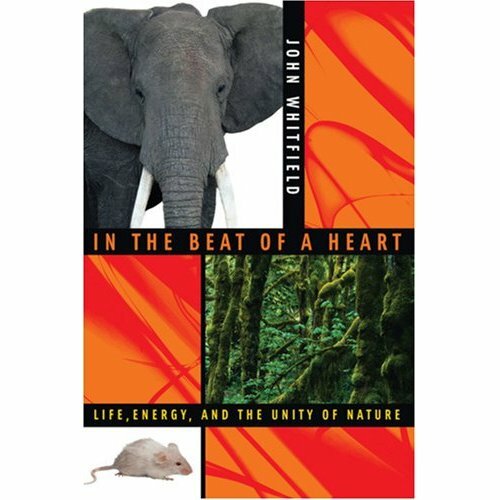 When I was at BookExpo this year, I wandered over to the National Academy of Science’s booth and got my greedy mitts on an advance copy of John Whitfield’s In the Beat of a Heart: Life, Energy, and the Unity of Nature. I’m glad I did. It’s a well-researched and accessible introduction to metabolic ecology, starting with D’Arcy Thompson’s early attempts to apply physics and mathematics to biology. Whitfield uses clear and engaging examples to teach readers about metabolism, how it scales with size, and its effects on life span, life history, and ecological patterns. And how not to give an elephant LSD. For the web-saavy, Whitfield has set up a site that links to his reference list, online background and biographical articles, and his blog. Bound to be a lot of interesting reading there. In the Beat of a Heart: Life, Energy, and the Unity of Nature 2006. Given the time of year, I think it’s only appropriate to honor another organism that eats turkey. Histomonas meleagridis is a parasitic protozoan. It infects all sorts of game birds but it’s at its nastiest inside a turkey, where it causes infectious enterohepatitis -- a disease colloquially called blackhead. Infected birds are listless and have yellow, watery droppings. And no wonder. 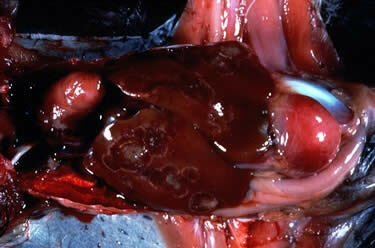 Histomonas forms ulcerated sores on the bird’s intestinal wall and necrotic bulls-eye shaped lesions inside its liver. Without medical care, the birds get emaciated and die. But one of the most interesting things about Histomonas is the way it gets from one bird to the next. The protozoan can’t encyst itself, which means it dries out and dies fairly quickly once it leaves its host. It gets around this problem by getting a ride from another parasite. Thanksgiving is tomorrow, and many Americans are gathering with their families for the annual celebration. This year, instead of sitting around after dinner watching football, why not round up the kids and do some fusion in the basement? Here's an article about a Detroit-area kid who's done just that. The article is a little misleading, however. While it certainly is quite an achievement for Mr. Olson to build a fusor, it isn't a particularly revolutionary development. Fusors have been around for nearly 70 years. They really do generate controlled fusion -- but the process consumes far more energy than it releases. That's the big challenge in fusion research: producing a fusion reactor which produces energy in quantities which make the whole thing economically feasible. Be sure to check out the new Zygote Games merchandise -- T-shirts and mugs featuring the wonderful artwork of Bryant (BONE WARS) Johnson and Fred (Parasites Unleashed!) Zinn. Christmas and Hanukkah are coming, and nothing says Happy Holidays like parasites and mallet-wielding paleontologists. The Leonids are coming. This weekend the planet Earth will pass through the trail of dust and debris left by comet Tempel-Tuttle, resulting in what should be a really good display of shooting stars. The peak dates are the 17th through 19th, which conveniently are weekend nights, perfect for staying up late and watching things fall from the sky. This shower is called the Leonids because they seem to radiate from a point in the constellation Leo, which is where the cometary dust stream crosses the Earth's orbit. As a bonus, this weekend also has a good chance for Northern Lights. So if it's clear where you are, you really should get out there one night this weekend and see what's up. -- Dress warmly. Really warmly. Bundle up, and then bundle up more than you think you'll need. You're going to be sitting outdoors on a late Fall night, not moving around much. You will be cold. -- Bring red lights. Your eyes don't adjust as much to red light as to other colors, so a red lamp or flashlight will help you see to get set up but won't spoil your night vision. -- Be patient. Don't try to scan the sky; just look to the East. You'll start to see streaks of light. Most are faint, but every now and then you see a bright one. -- Report any Giant Rocks From Space to the appropriate authorities. Today marks the 35th anniversary of the Mariner 9 probe's arrival in orbit about Mars, That event revolutionized the study of the planet Mars, and ushered in the "golden age" of unmanned space exploration by the probes of NASA's Jet Propulsion Laboratory. When Mariner reached Mars, the planet was enveloped in a worldwide dust storm. The atmosphere was completely opaque with orange dust. Mariner, with powerful (for 1971) onboard computers, could shut down and wait for better weather. The two Soviet probes which raced it to Mars were less fortunate: they performed a pre-programmed series of photographs, taking frame after frame of featureless haze. By the time the air cleared, the probes were unable to take any more images. As the dust settled, features became visible. The first surprise was the emergence of high mountain peaks. For decades scientists had assumed that Mars, being smaller and cooler than Earth, would have no mountains of any size. That turned out to be staggeringly wrong. Mars's lack of tectonic activity means its volcanoes can sit in one place over a magma plume and keep growing. Mariner mapped other features: the maze of cracks and canyons known as Noctis Labyrinthus, and the spectacular giant canyon named Valles Marineris in honor of its automated discoverer. The Mariner probes were the final blow to the old Percival Lowell-Edgar Rice Burroughs vision of Mars as a dry but fundamentally Earthlike world, possibly inhabited. The Lowellian Mars was ancient Egypt on a planetary scale, with ancient Martian engineer-kings building canals and cities. Mariner's Mars was different: it was a place of its own, with unique and astounding features. We're still learning its secrets. Mariner 9 is still in orbit around Mars, currently on the far side of the Sun. So at sunset drink a toast to a real space pioneer. You’ve been out walking the dog for ages, and he’s finally found the perfect spot. But your relief is short-lived. As his stool hits the ground, you see the little white spots that mean only one thing – your dog has a tapeworm. It’s worse than you think. He also has fleas. The dog tapeworm (Dipylidium caninum) lives inside the small intestine. It hangs on to the intestinal wall with its head, soaks up nutrients out of the food traveling through the dog’s gut, and grows. 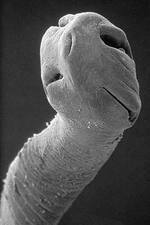 The tapeworm grows by adding new segments behind its head. As each segment moves toward the worm’s tail, it fills with eggs. Eventually the segment gets to the tail end of the worm and is released as an egg sac. The eggs leave the dog in its droppings. If you're in a place with clear weather this afternoon, you'll have the chance to see a fascinating astronomical phenomenon: a transit of Mercury. Beginning at 2:12 p.m. (Eastern Standard Time), the planet Mercury will be directly between the Earth and Sun, visible as a tiny black dot against the Sun's disk. How tiny? Very very tiny. Mercury is only 3,000 miles across, which means it is only about 1/300 the Sun's diameter. Even though Mercury is somewhat closer to observers on Earth than the Sun, it's still dwarfed. Given today's weather forecast, this danger is rather academic for us here at Zygote Games World Headquarters. So we're going to watch the transit with the help of NASA's Solar and Heliospheric Observatory (click on "real-time images" down at the bottom of the page.) Others can look here to find out when the best observing times are.